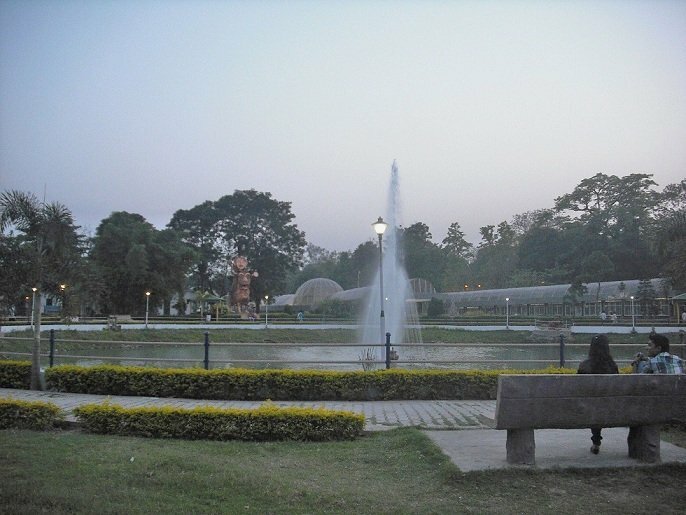 The Eco Park Patna is the ecological Park is also called the Rajdhani Vatika by the local people. It is situated in Patna, the capital of Bihar state of India. It is an urban park and is open throughout the whole calendar year. The project of the park was completed and inaugurated by the then Chief Minister of Bihar Nitish Kumar. This project was initiated and completed by the Department of Environment and Forest of Bihar. This Park constitutes of 1445 of walking pathway children’s corner and 1191 meters of jogging track. Nearby this Park is a zoo named as Patna zoo, was observing a heavy traffic before this park was completed. This is the actual reason why the Department of Environment and Forest of Bihar decided to build this Park. This Park contains two lakes and spread across 9.18 hectares of land. This park is the finest one of it’s kind in Bihar. This beautiful Park is the heart of tourism in Bihar this Park is full of greenery and contains more than 3000 of varieties of plants this greenery the lush green environment along with such varieties of plants makes this park a wonderful experience for everyone who visits this park. This Park is a place which is meant for every age groups and one can relax easily in this park. This Park has two large sections in one section there are children corner meant for the fun activities by the kids of food court which offers mouth-watering and delicious food with a variety of dishes, cuisines, foods, and beverages. This park also contains many huge and beautiful fountains that add to the beauty and environment of this serene park. The second part of this section contains unique and exciting theme parks like Rashi van, Guru van, and Kewli van. There are only a few theme parks in the country like Eco-park has. Along with these theme parks, this park also hosts the sculptures of cactus made by Subodh Gupta among others. The second large section of this park is connected by a tunnel to the first section. II section of Eco Park constitutes or contains the huge first class restaurant and a lake the visitors can enjoy the adventure of boating in this League Lake. Since both the sections are connected by the underground tunnel, one can easily go from one section to other. Eco Park Patna observes heavy traffic every month. Around one lakh visitors come and visit this park every month. The average number of daily visitors is around five thousand. This number increases to ten thousand on the weekends and some other special days. This park recorded a maximum of around forty-two thousand visitors in a single day on 1 January 2014. This number is still a record for observing this huge number of visitors in a single day. This park is loved and appreciated by all the people of Bihar and others who had visited this park. These astonishing numbers prove the above statement.